Ashwagandha is a wonderful plant that comes to us from the Ayurvedic tradition. It is known as an herb that helps to improve one's resiliency, cope with stress, and reestablish healthy sleep patterns. It is a calming and nutritive herb that has been used for thousands of years in Ayurvedic medicine and is considered to be an important rejuvenative and tonic remedy. Also called Winter Cherry, it is a cultivated plant of Indian origin. 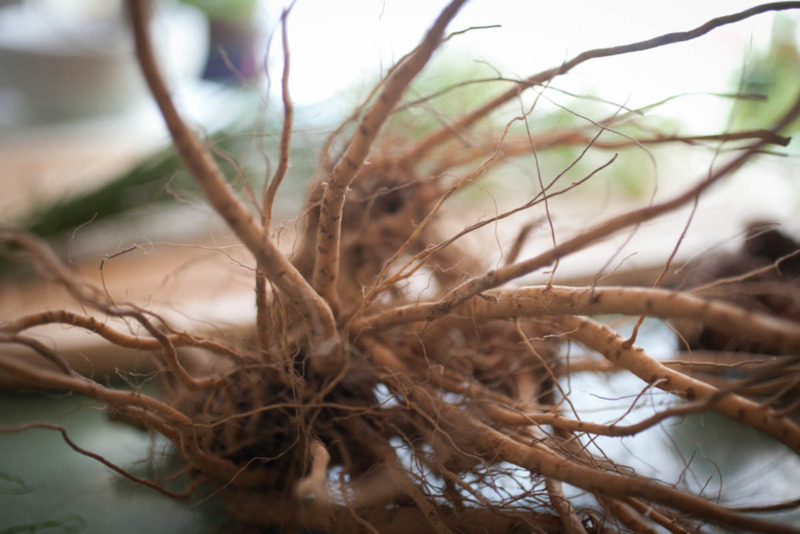 The roots are the prized part used in herbal preparations, and after just one growing season they can be harvested. Commonly ashwagandha roots are found in powdered form. Ashwagandha is a plant that has a range of benefits for the modern human: as a calming adaptogen it has been used for anxiety, stress, nervous exhaustion, adrenal burnout, depression and insomnia. Adaptogens are a class of herbs that help us to cope with daily stressors, increase our strength and resiliency, and support proper immune function. Because of these many positive qualities, in Ayurveda this plant is thought to be an herb of longevity. When taken over time, ashwagandha is said to impart the “strength of a horse” — and helps one to have increased energy, vitality, and fertility. It was traditionally used during times of debility or to recover from long-standing illness. The root is also very high in iron and has proven useful for anemia. Like many adaptogenic herbs, it generally works best taken over the long term, consistently for many weeks or months. One of the most interesting properties of this plant is that it has been shown to be very beneficial in restoring normal sleep patterns. Taken regularly ashwagandha may greatly help people that suffer from insomnia. NOTE: Ashwagandha is a member of the Solanaceae or nightshade family, which is a problematic group of plants for some people. Proceed carefully if you have issues with this group of plants. Also, some people may find that ashwagandha is too warming and strong for their constitution. Remember that everyone is unique and responds differently to herbs. Ashwagandha is commonly found in powdered form, and can be used as such in a capsule or mixed into liquid. As a powder it is traditionally taken in warm milk or mixed with ghee. The powder also blends nicely in honey as a paste, along with other herbs such as cinnamon or powdered rose petals. Finally, tinctures of ashwagandha are also available in instances when the powder is not convenient to use. What better way to take your ashwagandha than in hot chocolate?! Make this brew on cold winter nights -- it is lovely to sip on as you are winding down from the day. Steph Zabel is an herbalist and educator based in Somerville, MA who helps urban dwellers connect with the plant world. She teaches herbal classes, is available for individual wellness consultations, and is also the founder of HERBSTALK, Boston’s community herbal conference. Learn more about her work at: www.flowerfolkherbs.com and www.herbstalk.org. This blog post — Ashwagandha (Withania somnifera Solanaceae): The Strength of a Horse — is for general health information only. This blog post is not to be used as a substitute for medical advice, diagnosis or treatment of any health condition or problem. Users of this Web site should not rely on information provided on this Web site for their own health problems. Any questions regarding your own health should be addressed to your own physician or other healthcare provider. Newer PostThe perfect card for the one you love!